As beekeepers tend to their buzzing colonies this autumn, preparing to pollinate Kern’s almond orchards in January, bee bandits may be waiting in the wings, ready to swoop in and take those hives. California’s almond acreage expanded by seven percent this year, increasing the demand for bees to pollinate those orchards. The cost of pollination has risen steadily for over a decade, and now averages almond farmers $185 to $200 per hive, according to the California Beekeeper’s Association. Now bee burglars are stealing those high-value hives, renting them out to almond farmers, and cashing in during pollination season. Jack Wickerd, a third generation beekeeper and president of Happie Bee Co., had hundreds of his Weedpatch-based bees stolen not once, but twice. “We lost about 400 hives over the last six years,” Wickerd said. 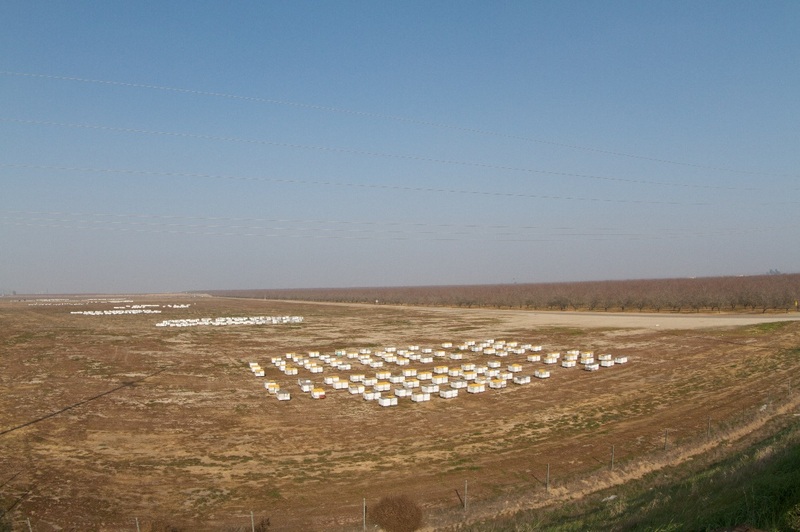 First in 2012, when he woke up to find 200 of his hives had gone missing the night before he was ready to set them out in the almond orchards. “I don’t think I could sleep that night,” Wickerd recalled. And most recently in 2014, thieves took over 220 of his hives. “They just picked them all up, and they were just gone!” Wickerd said. In total, Wickerd estimates he has lost $120,000 in profits. Last year the Fresno County Sheriff’s Office called Wickerd with rare news, They’d arrested two men charged with stealing at least 2,500 hives across California over three years, including his. “I was able to identify at least 00 boxes that were ours,” Wickerd said. The Kern County Sheriff’s Office had two reports of bee thefts this year, but even more may have gone unreported. Wickerd has since moved his bees out of Kern County, and has 1,000 hives marked with his company name and contact info, safely stashed behind locked gates. Some beekeepers also put GPS trackers on their boxes, and take out an insurance policy on their equipment in case it’s ever stolen.